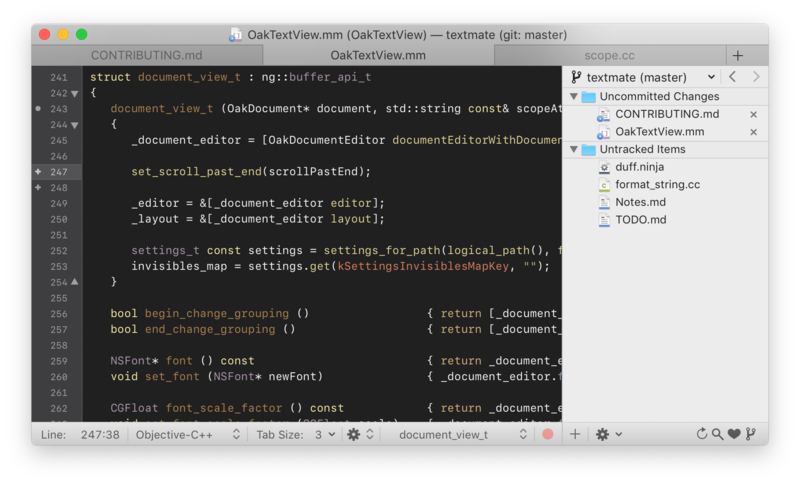 TextMate, powerful text editor for expert scripters and novice users added to Office/Editing directory. Janus Notes, anote-taking program for OS X and iOS that seriously respects your right of privacy added to Office/Editing directory. It syncs encrypted notes through Dropbox services. It is named after the Latin God Janus, depicted as having two faces since he looks to the future and to the past. Or, may be, cloud storage and privacy. Or Macintoshes and iPhone/iPad. Or sharing and control. To start simply add a note and begin writing. Janus supports only plain text in this version but the plan is to improve on that in the next versions. You can add attachments to the notes and they will live side by side with your notes. On Macintosh just press '+' (or drag and drop a file) to attach it. On iOS you can attach a picture (from the library or the camera), a link or take a voice note. Tap the attachment to see it on iOS. Double click or right click the icon on Mac to open or edit it. You can share the notes among different Macs and to your iDevices using Dropbox. Dropbox is free for the first 2GB of storage, you can register here. If you want to also share also with your iPhone and/or iPad, start from the iDevice: tap the Prefs button and then tap the "Start notes Sync With Dropbox" button. Simply provide your account information and you're done. Do the same on the other iDevices you have and your data will be seamlessly synchronized through dropbox. To share notes with your Macintosh, after initing the Dropbox sync on your iPhone/iPad, simply go (on the Mac) to "Prefs" and then go to your dropbox folder, then to the folder "Apps" and then to the folder "Janus-Notes". Select it and you're done. If you are sharing only among Macs, you can also simply create a folder under your dropbox folder and select it from the preferences from all the Macintoshes involved. Your notes can be encrypted on your dropbox to avoid eavesdroppers. To encrypt your notes simply select "Encrypt Notes" from the preferences and enter a password. When the notes are encrypted, the other devices will ask you for the same password. The encryption password is available in clear in the software and can be freely changed. It is saved in the System Keychain and, therefore, it is sure when the device is locked (as it should always be when not in use). The cloud storage (the real target of encryption) is always encrypted without any copy of the password. We feel this is the right balance between usability and security. Please note that attachments are not encrypted in any case. We understand that note-taking is a very personal thing and we tried very hard to keep your data as safe as possible. We have *no* access to your Dropbox storage beside the specific folder that we use for storing notes. Your data are safe. The Macintosh version is fully sandboxed and we have no access to anything other than the folder you choose and the attachments you added to the notes (a copy of them, stored with the notes). If you're privacy-conscious you should lock your iPhone with a code (this will encrypt the notes' cache on your iPhone) and use FileVault on your Macintosh. Remember to lock your devices when you leave them. Both the iOS and the Mac app do not "phone home" nor access anything else. There is no embedded analytics package for this reason. That means that we have no idea how you use the app and what is happening. Please send us your feedback and suggestions. RadioParadise || Official Radio Paradise application for Mac, iPhone and iPad added to Audio directory. You'll hear modern and classic rock, world music, electronica, even a bit of classical and jazz — with no random computer-generated playlists, needless chatter, or commercials. The mix always includes a carefully-selected assortment of new songs & artists, many of which you won't hear anywhere else. Most selections are in English, but Radio Paradise always keeps an ear open for great music in other languages. Our specialty is taking a diverse assortment of songs and making them flow together in a way that makes sense harmonically, rhythmically, and lyrically — an art that, to us, is the very essence of radio. If you don't care for what's playing at the moment, our PSD (Play Something Different) feature will select an alternative for you, then return you to the main playlist flow when it's done. Radio Paradise is also a community. Each song is accompanied by the thoughts & comments about it from your fellow Radio Paradise listeners. Discover why people all over the world make Radio Paradise their all-day every day soundtrack.